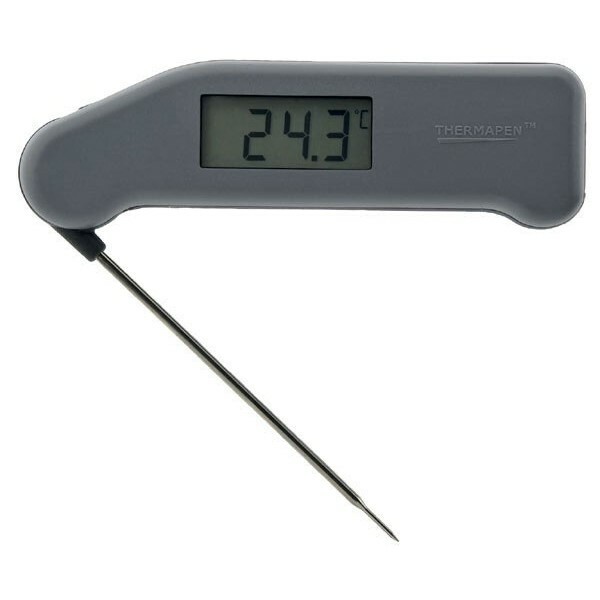 I was asked the other day – where did we get our dairy thermometer from and why and when do we use it? 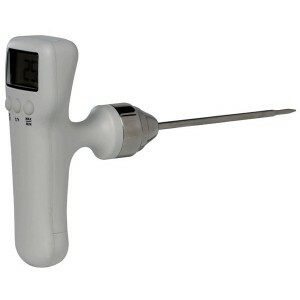 We have two dairy thermometers, both are made by ETI. Both have one decimal place digital read outs. We have two to double check that both read the same and in case one breaks or for some reason gives false readings. I bought them from e-bay and both came with 12 month HACCP certificates – necessary for our BRC accreditation. And because of this, we have to buy new replacement ones each year. We used to have an all singing, all dancing thermometer, with test caps etc, but it cost more to send it away to be serviced each year than to buy a new lower end model that gives the same results. I like the Therma 25T as it is easy to hold and is water resistant. Our back up is a white thermapen as in the picture on the right. It clicks on when you open the probe and shuts off when you close it back. It’s ok to use, but can be fiddly if you have wet hands. Like the Therma 25T, it also has 0.1°C resolution. Get one with one decimal place as there is a world of difference between 33.1 oC and 33.9oC. I also do not recommend an infra red thermometer as I do not believe they are accurate enough and also only measure the temperature at the surface of a liquid or mass. Our EHO pasteuriser tester uses one and it can differ from our thermometers by 2 degrees C, which in my book is significant. About every 10 minutes! We check the incoming temp of the milk on pasteurisation as a sort of safeguard that all is well with the pasteuriser. We use it to check the progress of heating the milk and ripening to know when we need to turn the vat off. We check the temp of the curd whilst rennetting, particularly important in our little dairy when it is cold. We use it to bring the curd to scald, gently over a slow period – we do not want to scald too quickly. Once the whey is taken off, the curd channelled, blocked and cut, we generally stop taking the temperature of the curd, unless it is behaving oddly, in which case, we will check it. But we do continue to take the temperature of the vat jacket which is another indicator of progress.